Hummingbird Mating. Some astonishing facts. There are many astonishing facts about hummingbird mating. In the Eastern United States and Canada mating of the Ruby-Throated Hummingbird begins in early spring upon return from their remarkable migration from Mexico and Central America. In the western United States other species such as the Anna’s Hummingbird start to mate in late December and early January until March and April. There are in between times for mating and never are there specific dates. Generally speaking we know that hummingbirds mate after returning from migration and when the weather is warm enough to enable plants to grow, providing a reliable food source. Of course, our hummingbird feeders also help the hummingbirds know that a territory is available to suit the food needs of the soon to be born baby hummingbirds. We always check the hummingbird migration map and hang our hummingbird feeders weeks in advance of the arrival of the first hummingbirds. We want our hummingbirds to have a good territory for mating right away. How does a Male Hummingbird Attract a Female? Like many birds,hummingbird male and females have different plumage. In most cases, the male is the more colorful. Our Ruby-throated hummingbird in Vermont is an example of one species having bright iridescent plumage on the gorget (neck). A few more include the Allen's hummingbird, the Blue-throated hummingbird, the Green Breasted Mango hummingbird, the Costa's hummingbird and the Rufous hummingbird. Many males have bright feathers on the crown of their heads or the front of their bodies. We can cite the Golden-Crowned hummingbird, the Violet-Crowned hummingbird, Emerald hummingbird, Azure Crowned hummingbird, Violet Crowned hummingbird, and Buff-bellied hummingbird. There are species with special tail feathers to entice the female including the Broad-tailed hummingbird and the Rufous hummingbird among others. What female can resist the stunningly handsome male hummingbird with his beautiful iridescent feathers and dashing gorget? The mating dive is an astonishing showy flight with many loops and zigzags. Usually the male flies up to an unbelievable 150 feet in the air and then plummets straight down pulling up just before impact. The courtship dive of the Anna’s Hummingbird is the most spectacular of all. This bird falls comparably faster than a jet fighter at full throttle or even the Space Shuttle entering the atmosphere! It has been discovered that the Anna's hummingbird orient their display dive in relation to the sun. This makes them look like an object dropping from the sky at the great speed of 385 body lengths per second.The Anna's mating dive makes them the world's fastest bird.Then they pull up against nine times the force of gravity and survive! Despite this showy performance, the male hummingbird does not mate for life.He does not help the female in any way to build her nest or care for her chicks.He simply waits to mate with the next females that enter his territory. Hummingbirds make many sounds during courtship. These chirps and whistles are very enticing to the female bird. An interesting fact about the Anna’s Hummingbird is that research has proven that some of the mating vocals are not vocal at all. Instead, the loud sounds are actually created by the bird’s tail feathers. This is a fascinating adaptation due to the bird’s tiny vocal cords. Overall, there are some differences and similarities among species in regard to hummingbird mating. We have only attempted to highlight several here. It is the female who chooses her mate in all species. Male hummingbirds are aggressive in attracting females. Sometimes the female leads the male to the spot where she has constructed her nest. The male will emit loud courtship calls or start the courtship display. She usually shows her interest by pointing her bill at him. But when she isn't interested or ready, the female flies away. 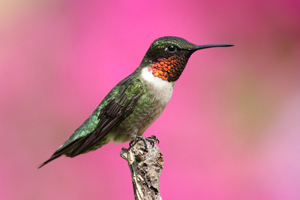 Here in Vermont, we have only one species of hummingbird, the Ruby-throated. However, in the west where there are numerous species, hummingbirds sometimes breed with females of another species, resulting in hybrid hummingbirds. Do Hummingbirds Protect Mating Territory? Yes, male hummingbirds do defend their mating territory. 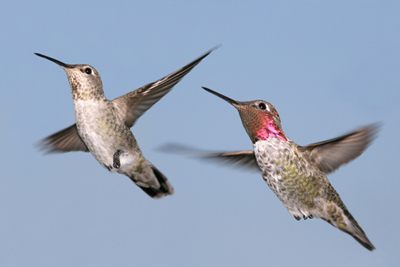 They do aggressively drive away other males with typical hummingbird aggression during the hummingbird mating season. In certain species, the male spreads his tail in order to look larger. Other species will ruffle their feathers to appear more like a force to be reckoned with. Most birds also use loud noises or the display dive to send away the intruder male.